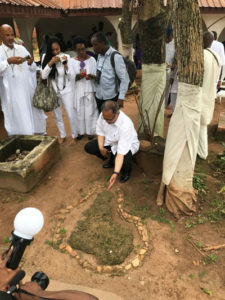 The National Newspaper Publishers Association, which represents over 200 Black-owned media companies across the U.S., recently traveled to the ancient city of Ile-Ife for a culturally impactful inaugural trade mission, which included attending the Olojo Festival. When it comes to what it means to celebrate the richness of African tradition and culture, you don’t have to wait for the next blockbuster Hollywood theatrical production to experience it – the real “Wakanda” is located on the continent of Africa and can be found in Ile-Ife, Nigeria. This is the real “Wakanda”! No… there is no Vibranium (that we know of) or any other state-of-the-art things that were featured in the Black Panthermovie, but there is a spiritual energy and connection to African tradition and culture that far supersedes anything you can read in books or see on television. When most people think of Nigeria, the city of Lagos usually comes to mind, primarily because it is the largest city in Nigeria and is considered by many to be the financial, industrial, commercial, educational and technological epicenter of Nigeria. However, the ancient city of Ile-Ife is widely regarded as the cradle of human existence based on the collection of historical information, empirical facts and science. According to Yoruba myth, Ile-Ife is celebrated as the original source of all mankind and is widely known for its many sacred shrines and spiritual sites that are meant to regularly highlight, promote and remember the Yoruba race and its cultural identities. 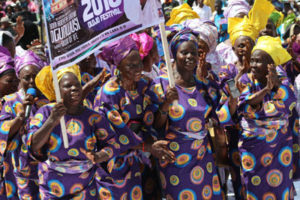 The Olojo Festival is celebrated annually as the spiritual confirmation that God created the world and deposited the elements of creation in Ile-Ife. 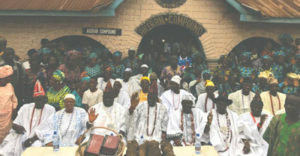 Thousands of dark-skinned and light-skinned people of African descent – both natives and tourists – descended upon the Royal Palace of His Imperial Majesty, Oba Adeyeye Enitan Babatunde Ogunwusi, Ojaja II, The Oonirisa (Ooni) of Ife, for this annual celebration to commemorate the dawn of creation and to highlight the historical and spiritual ties of Ile-Ife being the cradle of human existence. Although many different languages were spoken (African dialect, French, English, etc. ), there was one common denominator that connected the vast majority of attendees of the festival – they were Black, and they were beautiful. Uttering the Yoruba word, Ase (Ah-Shay), festival attendees were often seen placing both of their hands on their heads, as The Ooni of Ife professed a blessing over them, seemingly allowing his words to enter through their ears while allowing the words to capture and arrest their receptive minds. The word Ase means “So let it be/May it be so” and is akin to the word “Amen” that we most often use in America to provide affirmation at the end of a prayer or spiritual declaration. The spiritual encounters that were manifested during the festival were life-changing for some and awe-inspiring for others. The sounds of the native drum, coupled with the melodic voices of the natives of Ile-Ife, captured the ears of everyone who attended the Olojo Festival, from start to finish. People were seen bowing, dancing and directing uninhibited praise and sincere adoration towards the king, The Ooni of Ife, as he greeted the people throughout the festival. One of the hallmark moments of the Olojo Festival was the annual crowning of The Ooni of Ife with the sacred “Aare Crown”, which is the only physical symbol of authority the Ooni of Ife has inherited from his ancestors. It is the oldest crown in the history of crowns. According to tradition, the “Aare Crown” is believed to weigh roughly 132 pounds and is very heavy spiritually, but The Ooni of Ife is spiritually empowered to wear the crown during the Olojo Festival. The “Aare Crown” is extremely colorful like a rainbow and is made of 151 items, part of which are a cutlass, a hoe and other undisclosed objects. The crown is only worn by The Ooni of Ife once a year, during the Olojo Festival,and is always kept in a separate room in the Royal Palace under the watchful eyes of those assigned to that task. History dictates that the reigning Ooni of Ife must not look inside the crown, because any attempt to do so would result in him joining his ancestors. The “Aare Crown” serves as a traditional legacy from one reigning king to another. The honor bestowed on The Ooni of Ife during this spiritual experience is a site to witness. Such honor is rarely seen towards people of African descent in America. The only thing that comes close but still pales in comparison, would be the adoration and praise usually given to entertainers, athletes and other well-known celebrities. Black people have always appreciated entertainment, showmanship and enjoy a good party.The Olojo Festival was all of that and more. It was pomp and circumstance to the fullest. The Olojo Festival is not just a festival – it is a spiritual journey. It is a pilgrimage. It is Coming to Americaon steroids. It is definitely something to add to your bucket list. If the millions of African American people who went to see Black Panthertruly want to see “Wakanda” in its most authentic form, they would make it a point to go to Ile-Ife, Nigeria for the Olojo Festival and witness this authentic African festival that was completely devoid of White supremacy or European influence. Everyone across the African Diaspora should strive to make a pilgrimage to Ile-Ife, Nigeria for the Olojo Festival in order to experience African tradition and culture in a way that no book or no movie could ever allow you to experience it.